Cases are won and lost on direct examination. 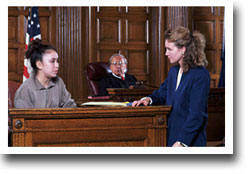 New advocates tend to undervalue direct and overemphasize cross examination. Sometimes  many of us learned this the hard way  the best cross is no cross at all. Direct, however, is the primary way to present the facts that must be proved to prevail. Direct is the way that the burdens of producing evidence and persuasion are met. Thorough and meticulous preparation is the key to a successful direct examination. You must know what you want to accomplish and orchestrate content and presentation to reach those goals.